Halifax coach Richard Marshall believes his players “disrespected” Workington in yesterday’s Championship Shield fixture. Fax eventually won 46-26 against their League 1-bound opponents, who arrived at the Shay with just 14 men, apparently because of injury issues. 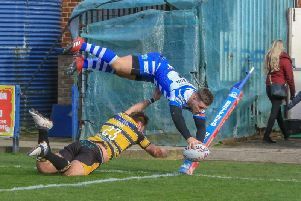 That should arguably have guaranteed Fax a handsome win ahead of next Sunday’s home semi final against Sheffield (3.0), but instead Marshall’s side led by just one score at 28-22 before three late tries gave the scoreline a flattering gloss. “I felt for them (Workington) at times and I wasn’t that happy with how we approached the game,” said Marshall. “I thought we disrespected the opposition and what they were about. “It’s 13 v 13 at the start and that wasn’t a performance that fills me with confidence going into next week. “When you see them travelling down here with 14, you perhaps make a judgement about how they’re going to approach the game. “There was probably some complacency there and we should really have put them to the sword. “If it hadn’t been for those two tries just before half time, it might have been a different game in the second half. “We had enough in spells and we showed glimpses of what we’re capable of, but there wasn’t enough of that. Unusually, Marshall was mildly critical of the match officials after a contest that lacked any real flow, although his side actually benefited from one of the afternoon’s more obvious howlers. “I thought it was a scrappy game,” he said. “It was very slow and I thought both teams got some harsh calls. “I thought Ben Johnston knocked the ball on before James Woodburn-Hall scored, for example. “To be fair, I thought there were too many calls, full stop; scrums being reset and things like that. Woodburn-Hall, who played a full game at centre, showed signs of promise; the young Londoner scoring two tries himself and laying on another for Will Sharp. “James has played in three positions in two games and you can’t knock him,” said Marshall. “That is what we’re taking away from this Shield if we’re honest; those four or five young players who have come in.